Nick Kyrgios, No. 24, reached his first ATP Masters 1000 semifinal by beating No. 12 Milos Raonic of Thornhill, Ont., in a matchup of big servers, 6-4, 7-6 (4). Nick Kyrgios reached his first ATP Masters 1000 semifinal by beating No. 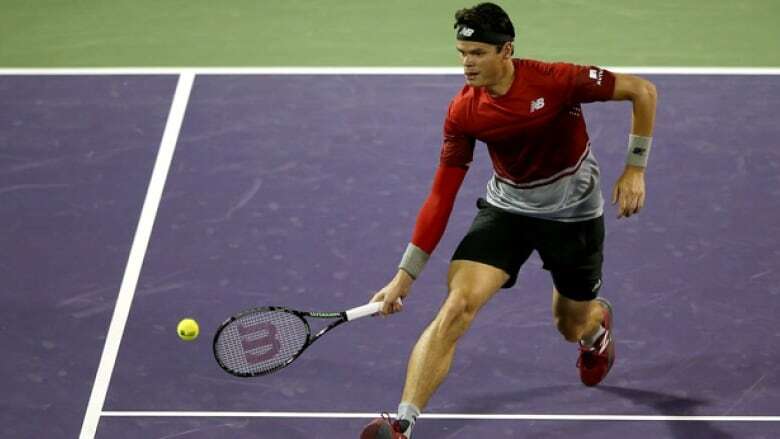 12 Milos Raonic in a matchup of big servers, 6-4, 7-6 (4). Kyrgios, ranked 24th, erased all five break points he faced and earned the only service break in the opening game. "To be honest I didn't think I was going to break during the match," Kyrgios said. "I came out really energetic and got pretty lucky. That definitely made me more relaxed." Krygios will now face No. 6-seeded Kei Nishikori on friday night. Nishikori overcame five match points to beat No. 16 Gael Monfils 4-6, 6-3, 7-6 (3). Monfils became soaked with sweat on a steamy afternoon but rallied from a break down in the final set. Nishikori fell behind 0-40 serving at 4-5 but erased those match points and another in that game, and overcame one more match point serving in the 12th game. "I thought I almost gave up the match," Nishikori said. "It was tough conditions. Especially the last couple of games, I don't know what I was thinking." Five-time champion Novak Djokovic will face David Goffin in the other semifinal. American twins Bob and Mike Bryan, who turned 38 this week, lost in the semifinals of doubles to Pierre-Hughes Herbert and Nicolas Mahut, 6-3, 6-3. The Bryans hold a record 16 Grand Slam titles but haven't won a tournament since August. Serena Williams' early exit at the Miami Open cleared the way for two younger players to reach the final. Svetlana Kuznetsova is 30. On Saturday, she'll face the winner of Thursday night's semifinal between Angelique Kerber, 28, and Victoria Azarenka, 26. Eight-time champion Williams, 34, lost to Kuznetsova in the fourth round, but the next generation of women's tennis wasn't ready to fill to void. Instead, Kuznetsova kept winning. In the semifinals, she erased 12 of the 14 break points she faced to beat Timea Bacsinszky 7-5, 6-3. The Russian is back in the final 10 years after she won the tournament. Kuznetsova hadn't enjoyed much success at Key Biscayne in recent years, but she won four consecutive three-setters to reach the semifinals. At No. 19, the Russian is the lowest-ranked women's finalist in the event since No. 38 Kim Clijsters earned the 2005 championship. Kuznetsova earned the first break of her semifinal in the 10th game of the grueling, 65-minute first set. She broke three consecutive times in the second set to pull away from the No. 19-seeded Bacsinszky. "I was playing to finish it in two sets so I have a little bit of time to rest," Kuznetsova said. If Kuznetsova wins the title, she'll return to the top 10 for the first time since 2010. She's already assured of surpassing $20 million in career prize money.